I realize that summer is over in some parts of the world, but for those who are still swimming, this next product is for you. Especially if you want to listen to music in the water. 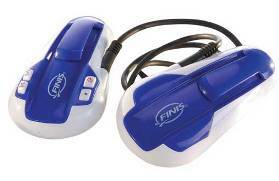 You can now have the best of both worlds with FINIS SwiMP3 player. This isn’t the first time that we have reported on the SwiMP3 player, or an MP3 Player that can play underwater. I think this is the first time we reported on one that uses bone conduction technology, which we have also reported on in the past. Bone conduction doesn’t require the user to stick anything in their ear to have good music, but relies on vibrations on the skin that somehow relays the sound to your brain. In the case of the next generation SwiMP3 player, the bone conduction apparatus fits directly on the side of the swimmer’s goggles. All the controls such as play, pause, advance tracks are all on the ear. Just to let you know, there is only 1GB worth of storage on this guy, but how many tunes are you really going to listen to when you take a dip, anyway? You should be able to get the FINIS next generation SwiMP3 player for about $150.